Home and Away legend Alf Stewart looks set to have his whole world turned upside-down when his troublesome grandson Ryder arrives in Summer Bay. Ryder, played by show newcomer Lucas Radovich, makes his debut on Australian screens this week and appears on Channel 5 in the UK from mid-November. The new arrival is the wayward son of Alf's daughter Quinn Jackson. Don't worry too much if you're scratching your head a little when it comes to Quinn, as she hasn't been seen in Summer Bay since 1995. Ryder is joining Home and Away with a bang, as his first storyline sees him break into the Surf Club to steal soda. Although it's hardly the biggest crime to have ever rocked Summer Bay, it still gets reported to the police and Alf is hopeful that the mystery culprit can be found. 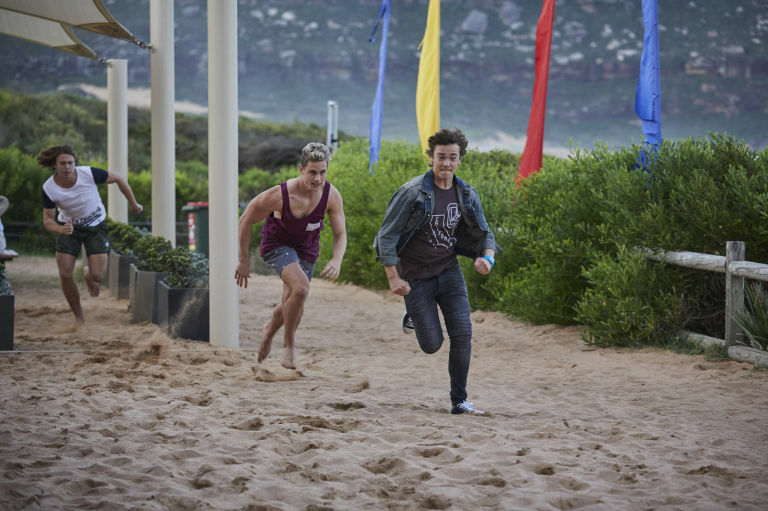 Later on, Ryder strikes again by trying to steal from Hunter King and VJ Patterson, who quickly realise that he must be connected to the Surf Club incident. Hunter and VJ march Ryder off to Alf to explain himself, but everyone is shocked when he introduces himself as Alf's grandson. None more so than Alf, who has no idea who he is! Speaking of his character's arrival, Lucas, 22, told Aussie magazine TV Week: "Alf reacts with disbelief. He doesn't understand who Ryder's mother could be." Even after Ryder explains himself, he refuses to offer up any contact details for Quinn – and Roo Stewart quickly realises that he must be running away from something. While we'll have to stay tuned to see what's brought Ryder to Summer Bay, it's already been confirmed that this storyline will lead up to a comeback for Quinn too – with actress Lara Cox taking over the role. Meet H&A Rookie Lukas Radovich. Most jobs are sink or swim when you are starting out. Fresh out of the Western Australian Academy of Performing Arts (WAAPA), Lukas Radovich found himself in unfamiliar territory when he came to Summer Bay. "This is my first acting job," the 22-year-old tells TV WEEK. The newbie says the sheer pace of the shooting schedule on Home and Away took some getting used to. "It was really overwhelming at the beginning," Lukas says of his starting out. "That's just because of the fast turnaround in shooting scenes and scripts you have to learn. "Just learning the shorthand of that has been challenging, but super-interesting. "It's always cool to talk to editors and soundies and camera guys and learn as much as I can from them." Lukas is the first to admit every day in the Bay is a masterclass in acting. That's because the youngster films many of his scenes with TV veterans - and TV WEEK Gold Logie Award winners - Georgie Parker and Ray Meagher. "I feel like Georgie and Ray are the people who have made the most impact, and that's partly because I've spent the most time with them," Lukas enthuses. "They've given me a wealth of knowledge, not just about the show, but the industry." Ray, especially, has shown Lukas the ropes. In the show, Lukas plays Ryder, the somewhat wild grandson of his character Alf. "Ray really has given me a helping hand," Lukas says. "He helps with making the script my own. He tells me they are not just words on a page.."
Strewth, that certainly is solid advice from the legend himself. Lukas just has to occasionally pinch himself to make sure he's not dreaming. "I can't believe I'm working with Alf!" he beams. Lukas grew up in the Blue Mountains west of Sydney, in a multicultural family. His mum's side of the family is Polish and his father is Croatian. The actor has two older brothers, neither of whom have anything to do with the entertainment industry. Not surprisingly, the family is over the moon to be seeing Lukas on TV. They must be doing something right at WAAPA - like Lukas, many of the graduates have found work in TV. Anneliese Apps, who played Beth, was in Lukas' year. As were former Packed To The Rafters star Angus McLaren, Love Child's Sophia Forrest and A Place To Call Home's George Pullar. And Lukas' housemate is Brittany Santariga, who plays school bully Jennifer in Home and Away. "It's inspiring to see everyone doing so well," Lukas says. Proving he's always been career-minded, Lukas worked in a talent agency before heading to acting school. "I might go back to it," he says. "But acting has always been a strong passion." As to that question that's on every female fans lips, the answer is yes, Lukas is "happily single". But for how long? Elsewhere in Summer Bay, Ryder Jackson could become the next member of the River Boys when he strikes up a surprising friendship with Dean Thompson. Ryder (Lukas Radovich) befriends Dean when he starts to feel lonely and isolated after breaking up with Coco Astoni. The split means that Ryder barely spends any time with Coco or Raffy Morrison anymore, leaving him bored as he doesn't have many other friends. After suffering an embarrassing injury while trying to bench-press at the gym, Ryder turns to Dean (Patrick O'Connor) for someone to talk to about his woes. Dean also confides in the teen about his own problems, revealing how he never knew his father and has nothing to do with his mother anymore either. Ryder is intrigued when Dean reveals how the River Boys became his replacement family, enjoying a life of surfing and parties. This sounds pretty good to the impressionable teen, so has a seed been planted in Ryder's mind? Home and Away airs these scenes on Thursday, October 11 at 1.15pm and 6pm on Channel 5. Elsewhere in Summer Bay, Ryder Jackson inadvertently puts his friends in danger when they head off on a daring adventure. Ryder (Lukas Radovich) is intrigued after Dean Thompson tells him about the River Boys' secret hideout, complete with an underground tunnel they always use to outsmart the police. Keen to check it out, Ryder suggests to Raffy Morrison (Olivia Deeble) and Coco Astoni (Anna Cocquerel) that they should spend a night there – joking that it could be haunted given its dodgy history. When the teens' sleepover proves surprisingly dull and uneventful, Raffy and Coco take pity on Ryder the next morning – deciding that they should leave the house via the tunnel as a shortcut to make up for the lack of excitement. Sadly, disaster strikes when they bump into the supporting structure in the darkness, causing the tunnel to collapse on top of them. As a result, Raffy is left hurt, alone and separated from her two friends on the other side of the rubble and debris. Will she be okay when Dean, Colby Thorne and new cop Chelsea Campbell later come to the rescue? Home and Away airs these scenes on Tuesday, October 23 and Wednesday, October 24 at 1.15pm and 6pm on Channel 5.